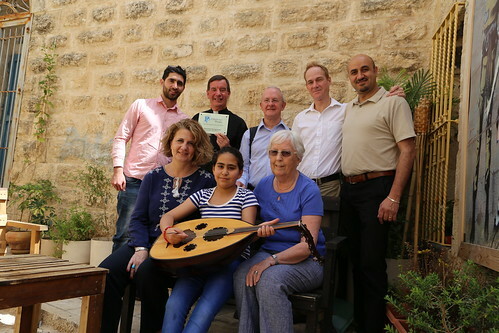 On Friday 22 April 2016, a group from Pilgrimage People in the UK visited students of the Tunes for Peace Project, and met with the students and the staff. 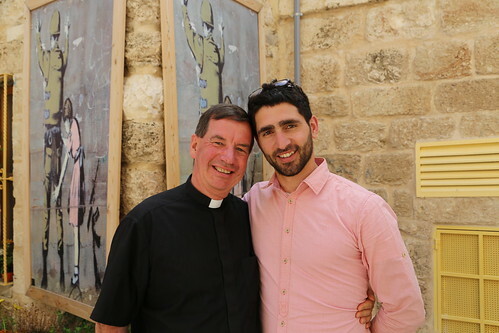 The group, led by Reverend Father Paul Maddison listened to an explanation about the project by both George Rishmawi, Director of PCR and Maher Kassis the Projects' Coordinator. In adition to Father Paul, the group consisted of four membrs of the Diocese of East Anglia. We discussed the possibilities of organizing a trip to our young musicians to the UK to perform to disocese members. Prevoius funds by Pilgrimage People helped Tunes for Peace Project introduce new instruments and teach more students. The Tunes for Peace project allows young Palestinians to learn music and play music without getting worried about the money, because it provides music education at a very low cost, affordable by any average Palestinian families.